Team Averda at the prizegiving ceremony. David Kenefick second from right of picture. A course change from east to west for the 2015 edition resulted in 14-days of testing upwind racing on the six-leg, 760-nautical mile course from Oman to Bahrain. Noted for being one of the toughest on record, the 11 pro-am racing teams with crews from 21 different nations experienced a truly unique, highly competitive, cultural adventure. 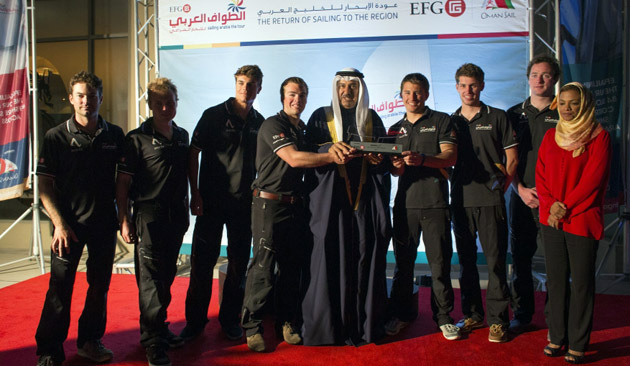 A third place in the final leg was enough to confirm Frenchman Sidney Gavignet and his mixed Omani and European team overall winners of EFG Sailing Arabia – The Tour for the second year in a row. EFG Bank (Monaco) were not the only champions in Bahrain on Saturday however with the new Volvo Ocean Race Rookie Award for the top two Under 30 sailors of the event going to Team Renaissance Omani sailor, Ali Al Balushi and British sailor from the University of Plymouth team, Richard Mason. Gavignet and crew; Damian Foxall (IRL), Alex Pella (ESP), Nicolas Lunven (FRA), Fabien Delahaye (FRA), Mohammed Al Mujaini (OMA), Abdull Rahman Al Mashari (OMA), and Abdallah Al Shukaili (OMA), sailed an impressive series but they didn’t have it all their own way. The three Omanis onboard the EFG Bank (Monaco) winning team, plus the Omani Renaissance crew and Navy of Oman team are testimony to Oman Sail’s vision of developing the region’s sailing talent and rekindling its rich maritime heritage through creating role models to inspire the next generation of sailors. They were chased hard throughout by Marcel Herrera, with Ireland’s David Kenefick , Helm/Trimmer, and a young student team from Plymouth University on Team Averda, who took second overall, and Zain Sailing Team from Kuwait headed by seasoned Tour competitor Cédric Pouligny with Gérald Véniard navigating, who finished third. As one of the toughest on record, the 2015 event has endorsed its status as a prime option for professional teams seeking winter training venues and for young aspiring offshore sailors seeking a race that will put them to the test. Volvo Ocean Race recognition of the event as a leading development race for young offshore sailors and the new Volvo Rookie Award for the top two Under 30 sailors has added another avenue of competition. This year’s lucky recipients will be flown to Newport, one of the Volvo stopovers for a weekend to watch the in port and pro am racing. To say this was a tough competition would indeed be putting it mildly and the end result must have been sweet music to the ears of the two Irish sailors in the EFG Tour of Arabia when they finished the 160 mile final leg from Doha to Bahrain, Damien Foxall with Sidney Gavignet in first place on EFG Bank (Monaco) and David Kenefick of RCYC with Marcel Herrera and crew on Averda in second place. There were twenty one nationalities competing, sailing over 1200 miles. Offshore conditions were at times very rough indeed and amongst the hazards on the course were oil rig barges under tow without any lights. No trip for the faint hearted. And to put things in perspective, David Kenefick as of today (Monday), is back at college in Cork. Well done David.